Speedy elimination of Japanese knotweed and equisetum? I have always dismissed direct application of herbicide to stem bases of herbaceous plants. Use of translocated herbicide on unwanted tree stumps is a well accepted and successful arboricultural practice. I now think it might work on some herbaceous plants too. I am not being original and this notion has always been floating at the back of the literature in a kind of anecdotal way. 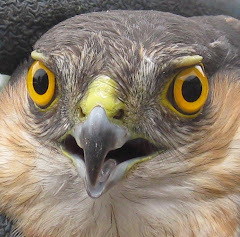 Today I offer two case studies. 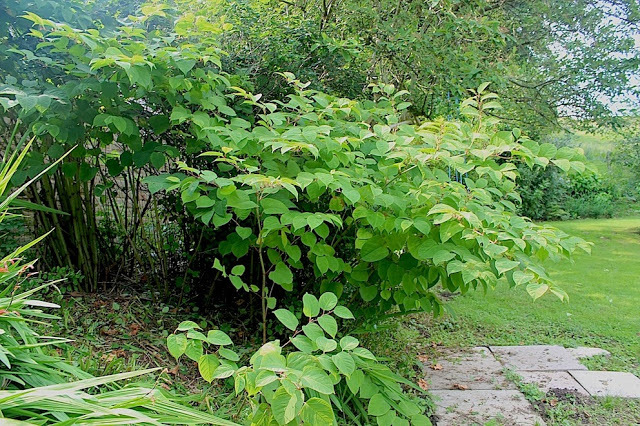 One I repeat from my earlier post when scientist Peter Williams used an injection technique wth an Autumn treatment on well established Japanese knotweed in his daughter’s garden. He completely killed it in one go. I take this as proof of principle that very strong glyphosate applied internally works very well. It is not quite the same as cutting the plant back and drenching strong herbicide down the hollow stems but it does depend on a very similar principle. My other case study is my own experience in Bolton Percy cemetery where I have completely killed a huge clump of an ornamental variety of mares tail Equisetum hyemale in a similar six month period from a single Autumn application. I have no reason to think that this equisetum is fundamentally easier to control than the regular weed Equisetum arvense; the only difference is that its hollow stems are wider. I also submit the anecdotal evidence provided by one of my readers. My post on control of Japanese knotweed (JKW) has been outstandingly popular and has been read 40,000 times and seems to be used as some kind of unbiased forum on this much feared and overhyped weed. 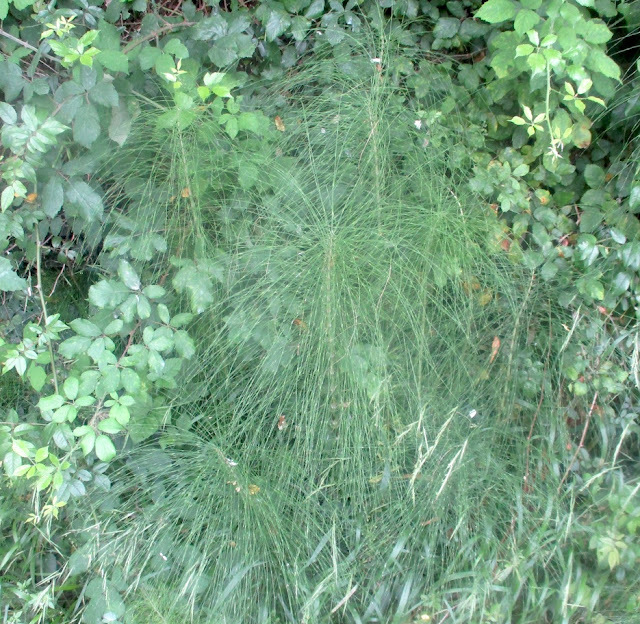 So too, dare I say it, has my post on mares tail that boasts almost a hundred comments. Reader ‘anonymous’ claims complete success when in late Summer he cut back his eight foot high JKW to about 15inches and completely killed it with very strong glyphosate dribbled down into its 2 cm thick hollow stems. I am personally much more familiar with spraying the necessarily well developed foliage of difficult weeds such as ground elder, couch grass, bindweed, mares tail and JKW. A large leaf area is needed to drink up the weedkiller and translocate it back to the complete root system. The roots must be intact and if the gardener has previously tried to chop out the weed he will fail or at least take very much longer. Roots will not be attached to the tops and sprouting broken roots will be at several different and un-responsive stages of development. In the case of mares tail the translocated weedkiller needs to go as far as six foot down. In the case of couch it needs to translocate horizontally a long way along attached rhizomes. Sometimes the advantages of an intact root are more subtle. In my post about eliminating ground elder repeated spraying was done over a three year period. The beauty of an intact root was that the reviving ground elder shoots over that period appeared more or less in the same place. This enabled me to use a strategy of opportunistically planting in any spaces from the second season. Where ground elder has been previously chopped and the soil has been worked it come up all over the place and tiny pieces infiltrate between the roots of perennial plants in such a way that you will never be rid of it. 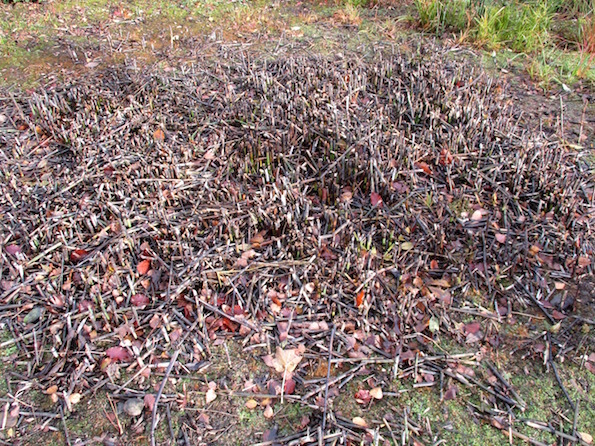 The need for intact roots is exactly the same with cut back ‘hollow stem weeds’. A heavy topped clump is beheaded and the roots must not be disturbed. It is of course totally useless to apply glyphosate to the soil. When normally spraying there are several reasons why it is best for maximum efficiency to use glyphosate at the recommended rate. My normal rate is 1:50 of commercial 360gm product. 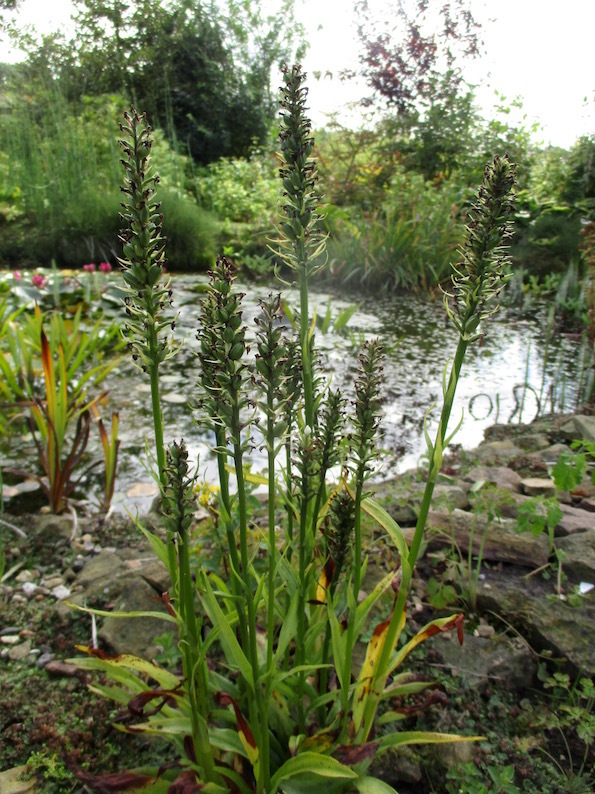 I sometimes go down to 1:100 and for very difficult weeds such as equisetum as strong as 1:30. Some weedkillers lose their efficiency if used too strong. This is not my own experience with glyphosate - even although some sources say so. If you are using amateur sources of glyphosate the concentrate is usually much weaker and you need to adjust your calculation. You can read about how Peter Williams spent a happy hour in eliminating a small patch of his daughter’s knotweed in my previous JKW post. Today I will more or less merely repeat the pictures. No trace of the knotweed ever returned. I did ask Peter what he would do if he had had a quarter acre of it as I had had in Worsbrough cemetery. He said he would spray because injection would be too fiddly. I do wonder however considering the exorbitant costs charged by cowboys whether even with thousands of ten foot stems it might have been worthwhile. I like the ornamental mares tail Equisetum hyemale although it does seem to grow with the same vigour as the common weed and given several years without competition from other strong vegetation builds up the same strong deep root resource. Such a root system will sustain new growth over many years of persistent weeding. I had planted Equisetum hyemale fifteen years ago in Bolton Percy cemetery, confident that with my spraying techniques I could contain it. I can. But I had not bothered and it had made a strong and dense four square metre clump. I do not want my legacy to be an overgrown cemetery and last Autumn decided to eliminate it. 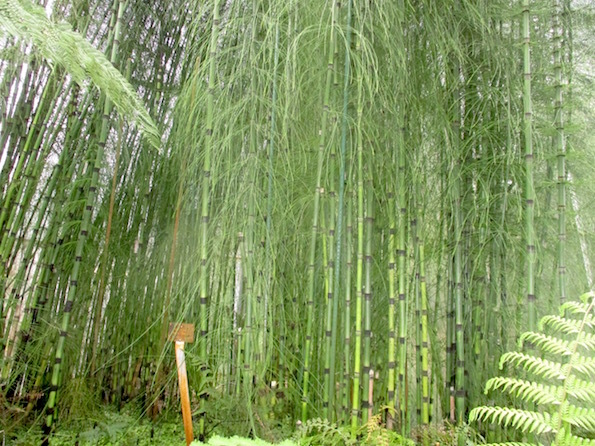 Equisetum is notorious for its silicon fortified surfaces shedding any herbicide spray. With Peter’s injection technique still in my head I must have read somewhere about stump application. I decided to try it! 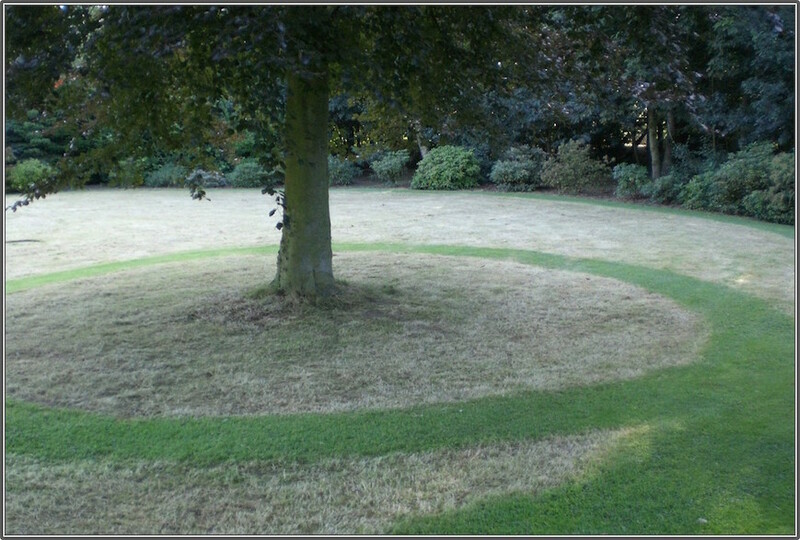 I cut the clump back completely to the ground last September using my hedge trimmer. I made up a few litres of a strong 1:15 (ish) glyphosate solution in my knapsack and with nozzle pointed downward and almost touching doused the stump clump heavily. I must have used more than a litre of the solution in total.The hundreds of exposed cups made by the chopped stems immediately drank it. I then diluted down the remainder to my usual 1:50 and did my regular weed control in the rest of the cemetery! I could not resist a further drench of my 1:50 before I went home a couple of hours later. You can see from the pictures that it worked very well. It was interesting to note that some stray more far spreading shoots I had left because the ‘cemetery team’ suggested they rather liked it died too. Attached to the original deep root resource it had received a lethal dose. There has been no regeneration what-so-ever since it was treated. No other adjacent plants and wild flowers were harmed. Nor was any other plant that had intermingled with Peter’s JKW. After two years there is no sign whatsoever of any this clump of equisetum in Bolton Percy cemetery. Quite simply zilch. Even more interesting is that a few wayward more distant shoots deliberately left since it is rather pretty, are gone too. Evidence that they were all coming from the same deep root system. Although I am confident that the technique works very well on JKW and Equistum hyemale I am not sure of its general value on common mares tail where most gardeners have already chopped it. Indeed I have often recommended repeated hoeing. Control for equisetum is an either/or situation where mechanical control is not consistent with chemical control - at least at the beginning. Nor is it easy for allotment holders when if they do manage to get rid of it, it immediately creeps back from a neighbour. Lots of slim small detached pieces make it impossible to use the drenching technique. Nor is there contact with the deep ‘mother root’ . If you are lucky enough(!) to start with a strong stand of unimpaired equisetum I think you will be successful. Strong luxuriant growth does have wider stem bases clustered together which in theory should take up the glyphosate very well. I observed on my original post how in normal undisturbed wild landscapes endemic vegetation intermingles with mares tail and they coexist together. In my post about the wildflowers of Tignes it was there up in the mountains and contributed to the wonderful ground cover carpet. It never achieved dominance amongst the grass and wild flowers. It is only when man disturbs the natural balance that it has the opportunity to build up huge reserves in its very deep root and become one of our most intractable weeds. Even in a small corner of Bolton Percy cemetery where I failed to bother to complete its elimination a few friendly fronds have popped up over the last forty years. 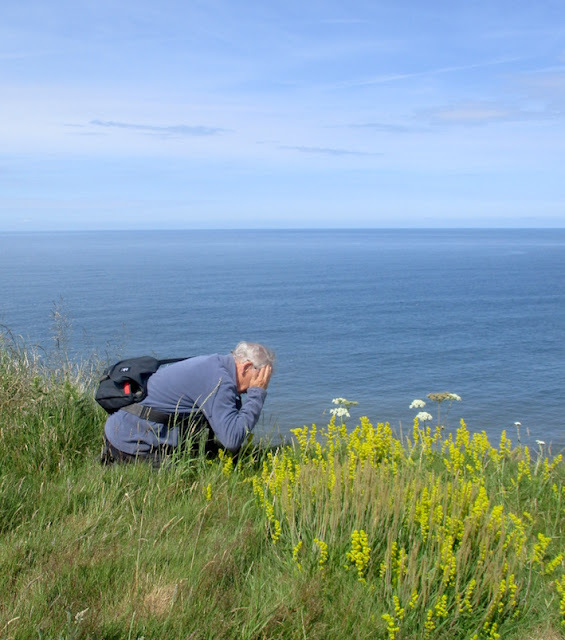 In my very recent post about the very beautiful wild flowers on the cliffs at Filey it was just the same. Stunning beauty and only such as Peter and myself would ever notice the mares tail. It’s really quite pretty! I feature in the following pictures Peter Williams’ own five hundred square metres of wild flower meadow. You would never know amongst the annually mown grass and long season of wild flowers that there is quite a bit of marestail. He tells me he originally tried the injection technique and as he expected it was too fiddly and gave him zero success. As mentioned above I suspect my drenching technique will only work on dense clumps. 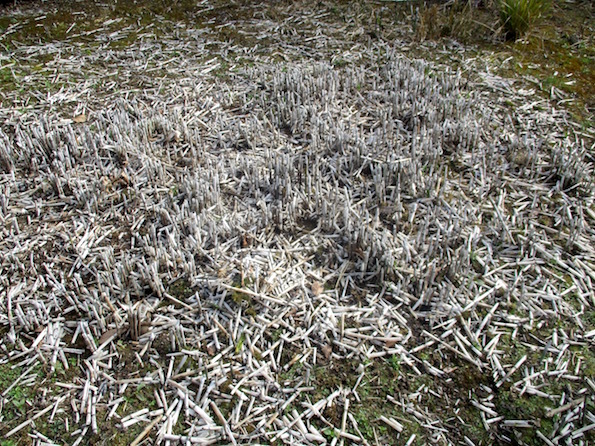 Readers have asked about equisetum invading their ‘clean’ garden from spores. It can spread in the wild this way but is very-very slow to establish. You would need to be grossly incompetent to allow this to happen in your garden! One of gardening’s biggest thrills is when this easy to grow hardy orchid spontaneously appears in a wild part of your garden. I you are a digger and always scratching the soil it will not be you. You need to be very observant as like most orchids it initially forms a mycorrhizal association with a fungus when the tiny-tiny seed receives nourishment from a fungal benefactor for a very long time below ground before it emerges. You will only find it when it first flowers and this will be in curious moist places such as under a light plant canopy, in your lawn or in bare moss or liverwort encrusted ground. Reward for the mycorrhizal fungus will be a lifelong partnership when sugars from the orchid’s photosynthesis pay back the loan. Such rare happy accidents are more likely to happen to you if you or a near neighbour already grow this plant. Life is never fair. The good news is that if you purchase a plant from a nurseryman or have the good fortune to have a friend who will give you division it thrives in most soils throughout the UK and is relatively easy for a good gardener to grow. A small flowering plant will cost a tenner or more. Say it doubles or even trebles up by natural division each year and every third year you separate the pieces, then in a decade's time you will be in clover. After several years more you will start getting lovely surprises. 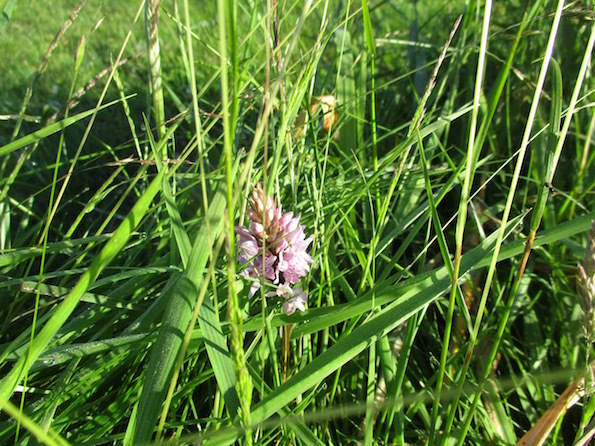 Nature does it all so much better and on suitable but unfortunately uncommon disturbed natural or manmade sites, fine stands of wild orchids can arise in just a few years. If you find any such places do keep the secret. Coincidentally when I wrote this, outside my holiday home at Hunmanby gap in eroded cliff two metres up from the beach I spied three dactylorhiza nestling amongst nettles in the crumbling soil. Optimists and very patient people amongst you might attempt to grow dactylorhiza seed from a seedsman. It might take a lifetime to realise that you have failed. It is beyond the scope of my article to speculate how the experts do it but it might involve using compost with soil that has previously grown dactylorhiza plants. Don’t waste your money buying trendy mycorrhiza in a packet. They are slow but easy, are tolerant of a wide range of soils and varying pH. The common species are totally hardy although this might not be true of all sixty of the European native species. They like moist soil although this is not completely essential. They will stand poor drainage. 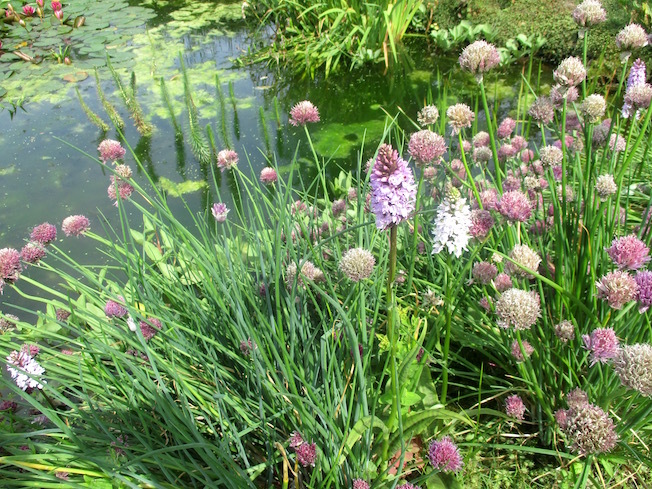 Some of my own grow adjacent to my pond but are not in the bog. My friend Peter grows them within and at the edge of his woodland. Some of mine are in a full open sunny position. Standard advice that shade tolerant plants sometimes need moister conditions when grown in full sun holds. Dactylorhiza often do well snuggling close to plants that provide a thin canopy. This does not mean that they should be near aggressive herbaceous plants that will outgrow them. It might be safer to give them their own space. My personal attitude to their maintenance is to leave them alone. I don’t knowingly use fertiliser nor do I water established plants or top dress with compost. This does not mean they might not sometimes be better with the help of these crutches. Only divide them if you wish to propagate more. Maximum increase will be if they are carefully forked out, teased apart and initially potted in good soil or potting compost. It is easier to manage delicate new plants when some level of protection can be given in such as an unheated greenhouse during the first few months. Such protection is not completely essential. Most of my own dactyorhiza were propagated by nicking out a piece at the margin of an otherwise undisturbed clump and directly replanting into the ground. 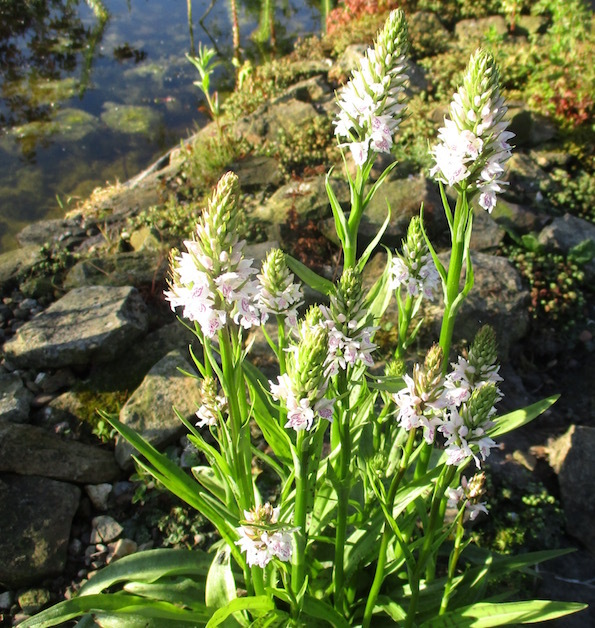 Standard advice is that dactylorhiza should be propagated when dormant. This might be at the very end of its season in Autumn. Perhaps better is to divide them in Spring immediately new shoots start to appear. I suspect your window of opportunity at this time lasts several weeks. Don’t expect to divide your clumps more than every three years. 1. My first experience with this plant was in my alkaline medium/heavy loam in Bolton Percy. 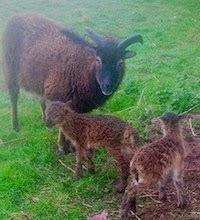 It was at the bottom of my garden on a piece of rough land we had purchased to extend our site. Planted on a slightly raised area above a depression that flooded in Winter it remained for several years unloved together with other ‘alpines’ I had purchased. By the time I had my very first garden open day ten years later it had made a rather large clump. I noticed a gentleman give it particular attention. I think he was a nurseryman. I noticed the next morning it was gone. 2. Several years after spraying off the weeds in Bolton Percy cemetery I noticed a dactylorhiza had emerged in a dry sheltered corner next to a path. After this first establishment over a year or two it did not increase further for perhaps fifteen years. I should of course have moved it to a more favourable site but somehow never got round to do so and it did not seem right. It was a talking point for my visiting parties. By the time I left Bolton Percy the site had deteriorated due to growth of adjacent woody vegetation. Like grandfather’s clock it stopped when I left. 3. I splashed out on a wonderful purple Madeiran Dactylorhiza foliosa and planted it in a moist organic rich part-shaded corner of my acid sandy Seaton Ross soil. It increased in size for a year or two before I raised the courage to divide it in September. Instead of my normal practice when dividing such perennials of chopping them up and immediately replanting I decided to give this valuable plant special attention. I carefully divided it and potted it up to give it the advantage of Winter protection in my unheated greenhouse. It was to be that dreadful 2010 Winter when for several weeks temperatures stayed down at minus 20 degrees centigrade. It was as cold or even colder in my greenhouse than outside. Plant roots in pots are much colder than those left in the ground. All my young propagules died. If only I had left them outside in the soil. Peter Williams who has provided most of today’s pictures has just given me a new one. 4. When I first met Brenda she had been helping her son in his lovely Cheshire garden. It was very moist and bordered a ‘mear’. (That’s Cheshire for you). Previously planted by a very fine gardener Brenda was weeding to slow the garden’s steep decline. There were these lovely plants with spotted leaves. Brenda has a good eye for a nice plant. She brought some back for me. I think of it it as her dowry. 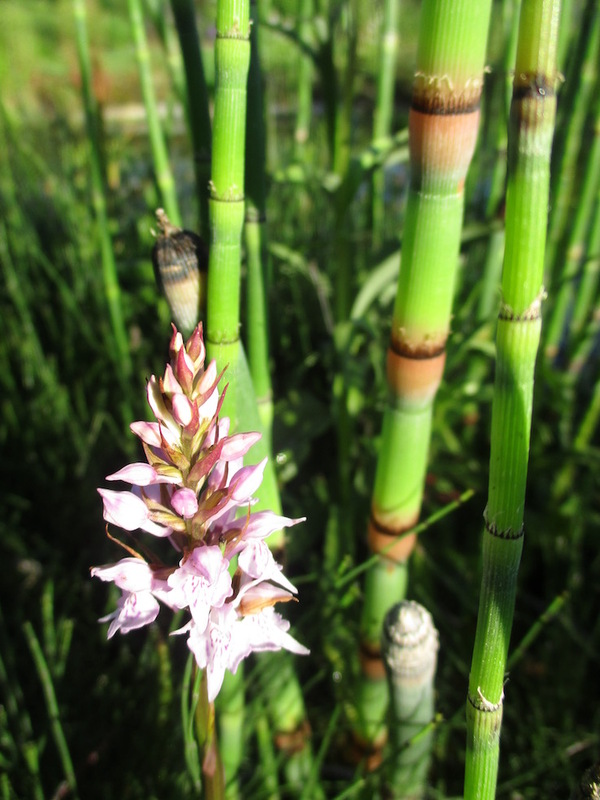 Twenty years later they thrive in a sunny position next to our ponds. 5. 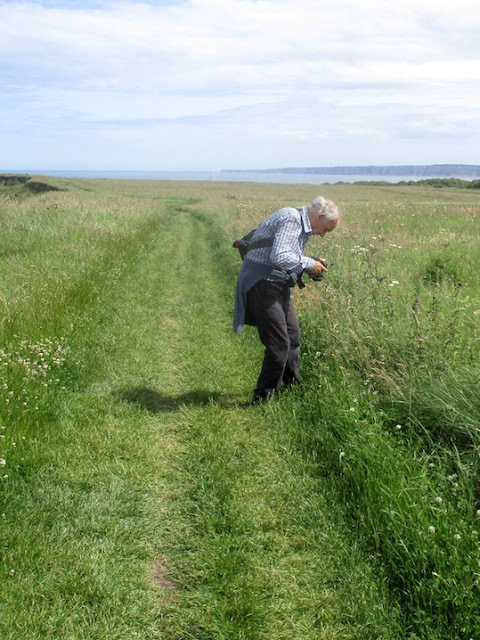 My latest adventure with dactylorhiza I described in my recent post about wild flowers in Filey. Peter Williams volunteered to photograph three scruffy dactyorhiza I had discovered in crumbling cliff very close to the sea near our holiday home. 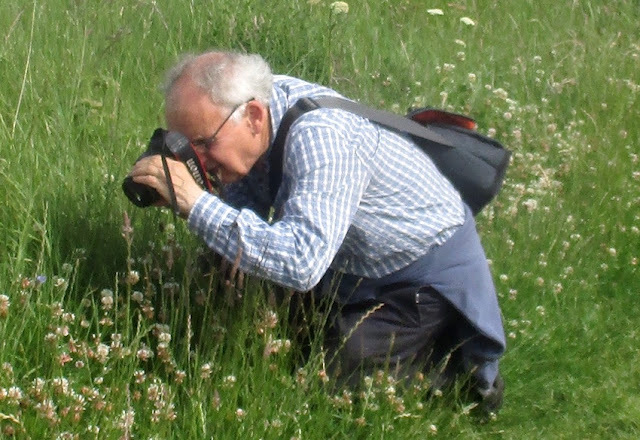 I related his frenzy of activity as he photographed wild flowers for the rest of the day! That afternoon we walked up on Filey Brig and gingerly peered over the high unsafe dangerous grassy edge as you walk towards Scarborough. In the frequently crumbled steep bank there were tens of thousands of orchids. My wife Brenda recently hosted a small gathering of long retired Askham Bryan colleagues and their partners in our garden. Please indulge me today as I wallow in nostalgia and share a few memories as old folks do. Brenda’s lunch was as ever superb. Peter Williams not only took the pictures but after coffee on arrival we visited and marvelled at his own garden. He says his camera focus was out of focus but his pictures look good to me. Peter Hemsley (bending) told me that to capture this lovely invasive alpine’s true colour my camera needs a blue filter. Botanist Philip Orton (great pullover) micro propagated Dicentra ‘Snowflakes’ when it was launched at Chelsea thirty years ago. My guests look a little bored with my mulching stones (spoil from Worsbrough cemetery). Peter (dig that hat) spots, identifies and admires my Salix fargesioides. No previous visitor has even noticed it! Former mature student 88 year old Alan Warwick explains his hypothesis. Thirty years earlier Alan had interrupted Philip Orton's botany lecture to tell him he was wrong. Alan’s tree Malus ‘Crimson Cascade was launched at Chelsea this year. Tony Thompson confides with his wife Margaret. Rhona looks on. Tony helped me run the NCH course (he did all the work).This craft all-comers course (provided students had practical experience) was the best in the college. More of a traditional gardener than me, ex Radio York gardening guru grows dozens of potato varieties and is the most loved and remembered tutor by former students. "Brenda tells me he has lost his Stipa gigantea"
As a former Wye college student I admired fellow student Rhona’s effervescent personality and beauty from afar. Askham Bryan lecturer, more lately nurseryman and hill farmer (sheep) still lectures to gardeners. One of the kindest people I know. Christine Hemsley and Isobel Ashford confer. Cameraman Peter Williams is not getting away without a mention. 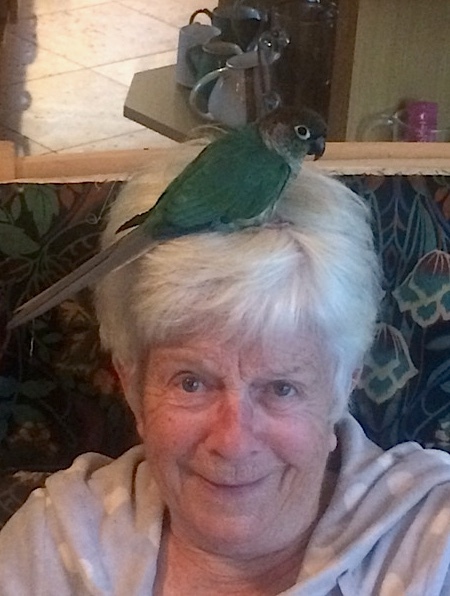 My best friend and his contributions are well known to readers of this blog. His garden in Seaton Ross village is one of Yorkshire’s finest. As a York University man he has not been privileged to work at Askham Bryan! I told the story about the Chelsea launch of Dicentra 'Snowflakes' and how micro-propagator Philip Orton and Yorkshire author Joyce Fussy's new dicentra was introduced. They were guests on celebrities day. Poor Alan Warwick was only invited with the punters when his Malus 'Crimson Cascade' was launched this year. Things are not what they used to be. See Peter Williams' lovely garden in this post. Peter's and my own garden are both open on Tuesday 22nd August in aid of Yorkshire Arboretum - combined ticket £5. More details on their website. This is probably the best of the fertilisers on the amateur market and for me is only now exceeded by professional ones such as yaramila. Working in the fertiliser industry fifty years ago David reasoned that a good fertiliser should be formulated with more sensible proportions of NPK and should contain necessary trace elements. Vitax has been a market leader for fifty years and the same company has produced it for all of that time. He was recently invited to a slap up celebration by the company for the fertiliser’s fiftieth anniversary. Great for an old employee to be remembered.